Casa Ventura - Easy Walk to Park and Town! Welcome to Casa Ventura - a sprawling single family home that has been designed for relaxing in the sunshine. As though ripped from the pages of Better Homes & Gardens Magazine, this modern Executive Villa is gorgeous both inside and out - combining sleek transitional style and comfort to create the perfect luxury vacation home. 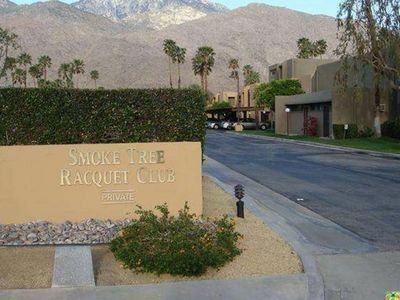 Located on a quiet no-outlet residential street in the heart of Palm Springs, this resort-like property is very private, elegantly appointed, extremely livable and carefully space-planned for spending quality time with your entire group. 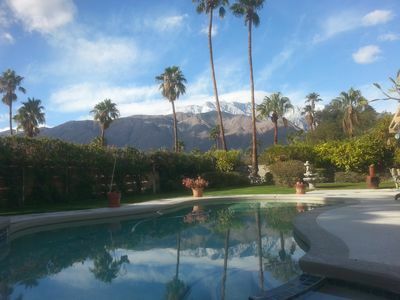 Casa Ventura is like being at home -- but way way way better! 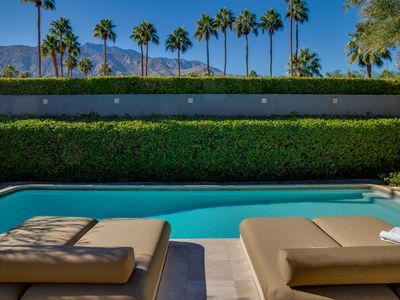 Swimming pools, movie stars, sunshine, luxury and elegance. This property captures the magic of Southern California glamour. 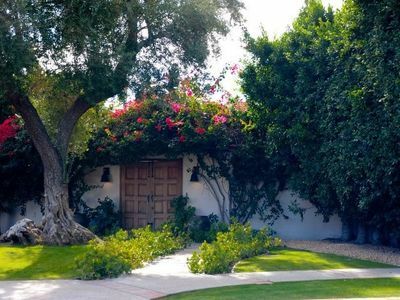 Completely walled for privacy and enclosed by a mature ficus hedge - you will feel as though you are at your own private resort. 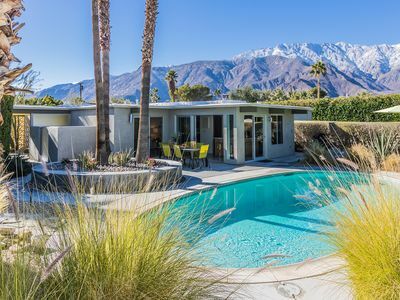 Stunning mountain views, beautifully tailored poolside daybeds, an outdoor living room, al fresco dining, and a built in-barbecue station. The pool itself is large and inviting with jets and a sitting bench at the shallow end - perfect for sunning and splashing. There is something very special about Casa Ventura. It is the type of desert paradise guests return to year after year. While over the top gorgeous - there is also an easy elegance about this home. 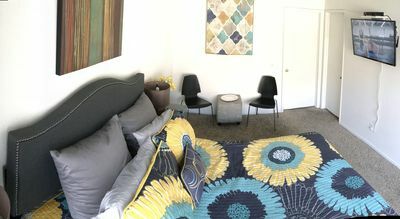 Soothing color palette, comfortable designer furnishings, beautiful artwork, six flat screen televisions, a well-stocked chef’s kitchen, formal and informal interior dining, and a plush media room for hours of binge-watching pleasure. All along the back of the house - are large french doors that form glass - blurring the lines between indoor and outdoor living. 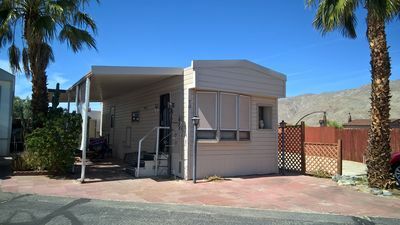 This is the perfect holiday home - well suited for long weekends, week-long stays, by the month or by the season. Like a specialty boutique hotel, all four sleeping quarters are beautifully decorated, feature hospitality-quality king-size mattresses, flat screen televisions, and ample storage. The North Wing is spectacular - featuring two King guest rooms, a morning center, a deluxe bathroom with dual sinks, a shower and a tub. The Master Bedroom, which opens on to its own patio, has a spectacular ensuite that also has dual sinks, a shower and a tub. The Guest Casita is set off privately with its own entrance and ensuite bath - very serene. 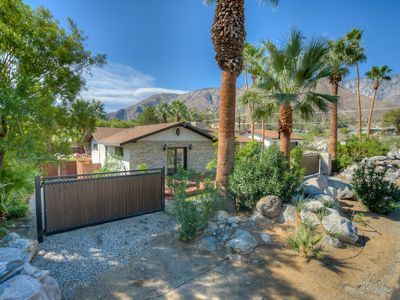 Casa Ventura is centrally located in the heart of Palm Springs’ El Mirador neighborhood -- just a half block from Ruth Hardy Park -- and less than a mile from the world famous Palm Canyon Drive as it cuts through the Uptown Design District. Casual eateries, fine dining, coffee spots, art galleries and specialty boutiques are all within walking distance. The Convention Center, The Casino and the public tennis courts are also very close by. 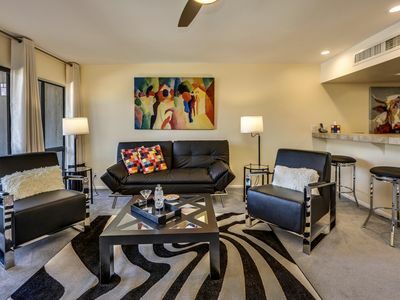 You'll be just minutes from movie theaters, museums, and live performance venue. You'll even find grocery stores, burger joints, sandwich shops and every other convenience imaginable, all within a mile or so from this gorgeous property. And you’ll be just a few blocks away from a few stops for The Buzz - our City’s Free Trolley Service that whisks you up and down the length of The City - all day and night Thursday thru Sunday. Suitable for extended weekends, month-long visits and as a seasonal rental. Optional concierge services including daily maid service, poolside massage, pre-arrival grocery stocking and private chef are available with three weeks prior notice. 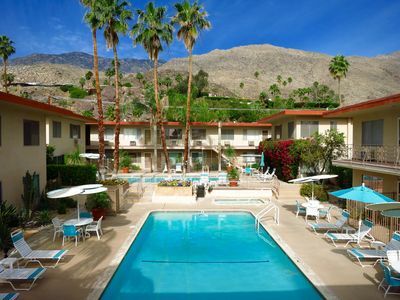 The Citrus House, "Best in Palm Springs"*, closest luxury property to downtown! FEBRUARY 2020 AVAILABLE. "The best views in the building." South PS. Quiet unit. New Listing -Private Luxury Estate in Little Tuscany! !